If you’re familiar with the Polar Bear brand, you’ll know their products have been favorites of many trekkers for over a decade. 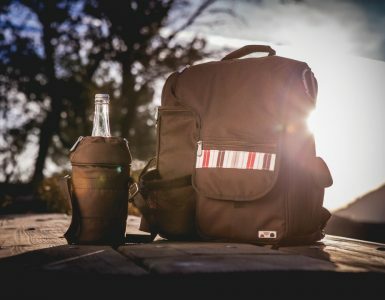 Fancy a long lasting backpack cooler? Their coolers are synonymous with quality and durability. Each cooler is made using only the strongest liner which ultimately guarantees you a long-lasting product. 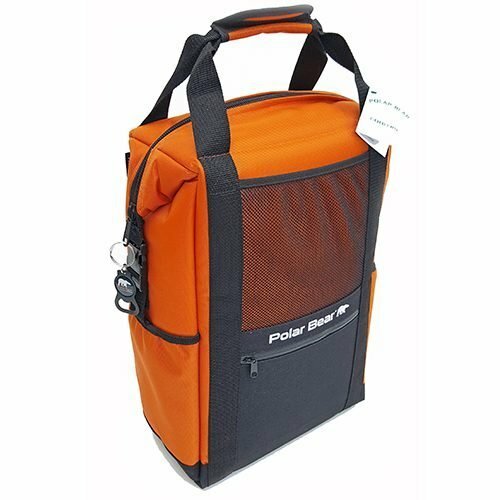 Polar Bear has a number of coolers within their range which you can pick from. However, the Nylon Soft cooler is the most popular in the collection. And no, this is not only because of its attractive bright color but its versatility as well. Still not convinced? 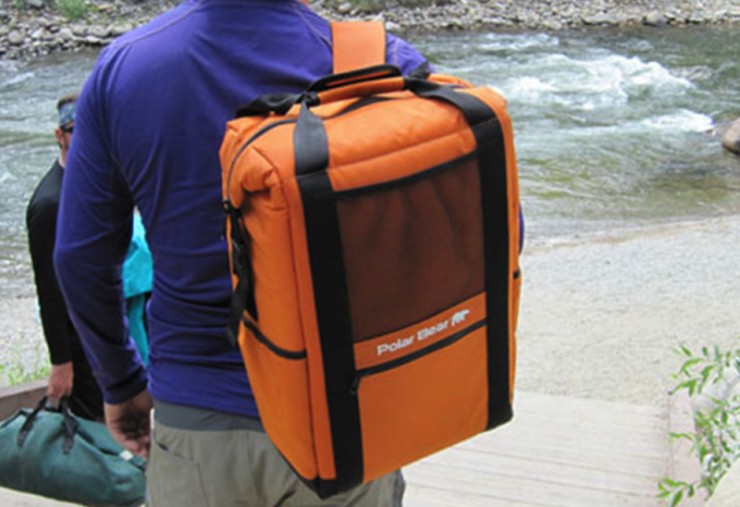 Have a look at our in-depth review of this backpack cooler as we discuss its diverse features and where it excels. You might just decide it’s worth taking with on your next hiking adventure. Here we have a backpack cooler which features an innovative design and was carefully crafted using quality materials. It ticks all the right boxes where functionality and convenience are concerned. For this reason, we reckon it’s the perfect cooler for everyday use. Whether you’re thinking of going fishing or hunting, you can do so with this versatile backpack cooler. Its huge draw card has to be its insulating capabilities; after all, that’s the whole point of a backpack cooler right? Polar Bear products are known for showcasing the brand’s famous patent chilling technology to keep contents cold for extended periods. You don’t have to worry about your ice melting a few hours into your hiking trip. It’ll be kept solid for up to 24 hours and here’s the best part—even in 100+ degree heat! This is made possible by the cooler which houses a 1” thick, 10-gauge, high-density foam insulation. Just ensure you pack it correctly – the weight should not exceed the carrying capacity specified above. In the event that it does leak, rest assured your trekking gear won’t be affected because it is leak proof. No droplets of water will escape from this cooler backpack. Polar Bear believes the value of a cooler is in its liner. That’s why this cooler backpack is made using only the strongest and safest liner. All liners of the Polar Bear Coolers are double coated with TPU nylon for guaranteed longevity and this cooler is no exception. This interior liner is made incorporating materials with anti-microbial properties which are FDA approved for your safety. Your perishables will be kept fresh & edible for longer periods – which is a definite plus. A cooler which is sturdily built is your best bet as it will last you longer. For this reason, you’ll like that the outer shell features a rugged design and is made using luggage grade nylon. This material has a denier rating of 1000D so you can tell it’s built to last. Also, the nylon shell has tear resistant properties to guarantee longevity. Like all Polar Bear bags, the bottom saddle is sturdily built for added durability. It’s also designed to offer support and stability—even after contents are packed inside. The only problem is that the base isn’t waterproof. As a result, you must be careful where you place it: Avoid placing it in puddles. In addition, the seams are both double stitched and also anchor stitched – meaning they won’t rip any time soon. This cooler backpack features a heavy-duty YKK Zipper which is rust-proof. This unbreakable zipper won’t rip off your cooler thanks to its patent-pending design. A backpack that provides you with ample storage space is the one you want. This cooler promises to take care of your storage concerns thanks to its multitude of pockets. All your essentials can be kept within reach by storing them in the side zippered pocket provided. It allows you to store not one but two water bottles in the pockets. You’ll also find the mesh pocket quite handy for your other valuables. Even though it’s made of durable fabric it’s still pretty lightweight, so your shoulders won’t suffer much strain. You can carry it comfortably for hours. 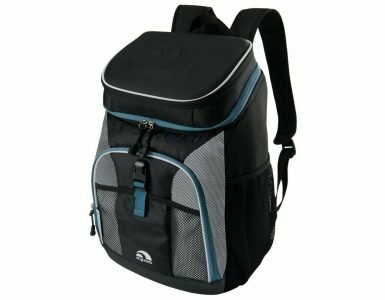 While on the subject of comfort, moving around with your cooler will be a breeze thanks to the padded shoulder strap, expertly designed for your carrying comfort. Additionally, your back is also spared from any fatigue thanks to the 2” backrest, which is also padded. The heavy duty release buckles located on the side will keep contents securely stored inside. For added security make use of the four tie downs. As mentioned earlier, the nylon cooler has visual appeal. 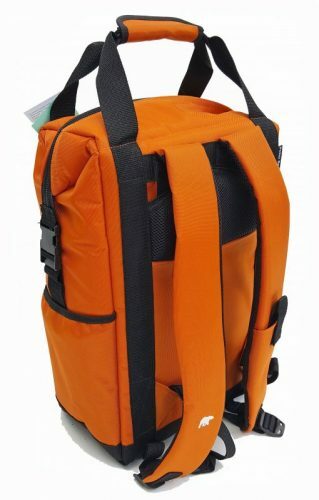 So, if the way a backpack looks matters to you, you’ll like the pop of orange color. However, if you’re not a fan of bright colors, it is also available in other colors including camo or black. You’re bound to find one that matches your individual style & preference. Thinking of gifting someone a cooler backpack? Pick this Polar Bear cooler which you can customize according to your preference to make it stand out – in a good way. It can be embroidered with text, monogram or a logo—it’s entirely up to you. Polar Bear can help you with this particular service. All you need to do is to click the “customize” button when placing your order and they’ll readily assist. Polar Bear is so confident of their products that they offer a one year warranty on these coolers. This warranty covers any manufacturer’s defects you’re not happy with upon purchase. However, you still need to handle this cooler backpack with caution. This means you must avoid placing any sharp or pointed objects in the cooler to avoid any premature damage. One of the major downsides of this cooler is that you may have to keep it upright at all times. In some instances, if you tilt it, water will leak out of the zipper. Also important to note, at first the bag has an unpleasant smell – even after airing it out. However, this isn’t a deal breaker as the smell does disappear after a couple of weeks. 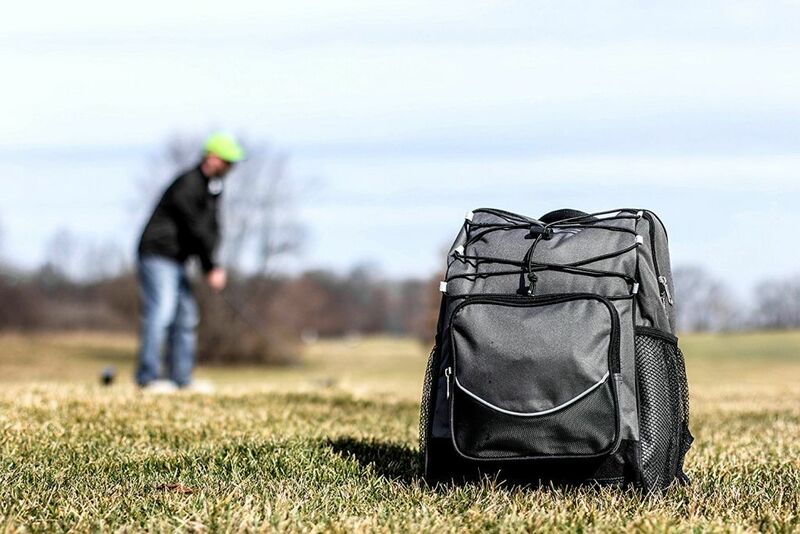 Overall this bag is worth considering because of its impressive functionality and versatility. It’s made of superior quality materials which is proof of its durability. You can enjoy a comfortable and hands-free experience during your outdoor activities for hours with this cooler. Even when packed, it’s still lightweight and won’t be causing any shoulder strain thanks to its padded shoulder straps. Best of all, it keeps your cold contents super cold – even at the beach. If that’s not a winner, we don’t know what is. 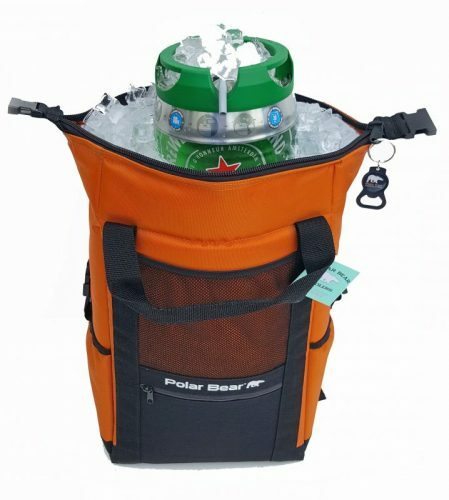 The next time you think of embarking on an outdoor adventure, consider this Polar Bear cooler – you won’t regret it.